We have recently launched the Andrew Brookes photography website. Andrew specialises in studio and location photography receiving multiple awards and recognition in his field. Below is a preview of the website. To find our more please visit www.andrewbrookes.co.uk. Andrew approached Webbed Feet UK for website design and build of a brand new photography portfolio. Andrew was quite specific that he wanted a much lighter website this time around but left the core layout and design up to us. The core principle of the design is to showcase Andrew's work in the form of galleries. Our solution was simple, a grid based strucuture that's responsive on all mobile and desktop devices. The use of colour in this design is used to differentiate the content sections. Andrew's work is the main focal point of the design. Andrew's website is easily updated to add new images and blog articles. It uses our powerful Content Management System (CMS) to achieve this. It allows Andrew to add new keywords and phrases for continuous search engone optimisation (SEO). 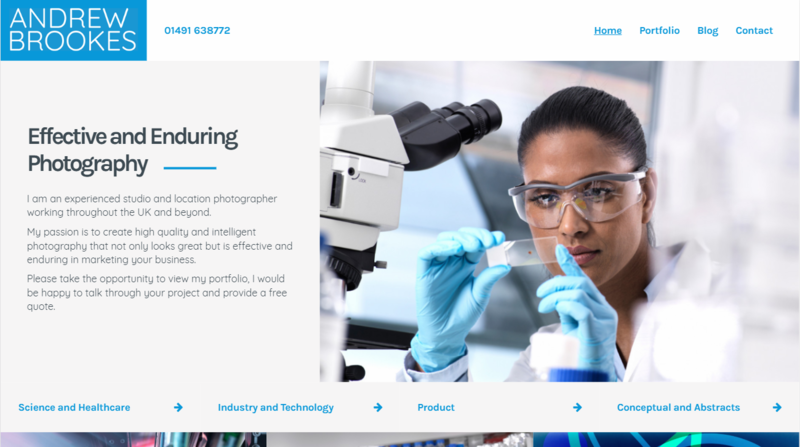 We design and build photography websites from scratch. Contact us today to find out more.